Beeldspoor is the Rotterdamse Schouwburg’s art gallery. The idea was thought up at the opening of the building by architect Wim Quist and the then director Carel Alons. Every year 3 artists are commissioned to make a piece – inspired by theatre – on an aluminium sheet of 90 x 105 cm. Starting from the idea of a portrait gallery I proposed making a portrait of a theatre-artist who has been an inspiration to me as a visual artist. 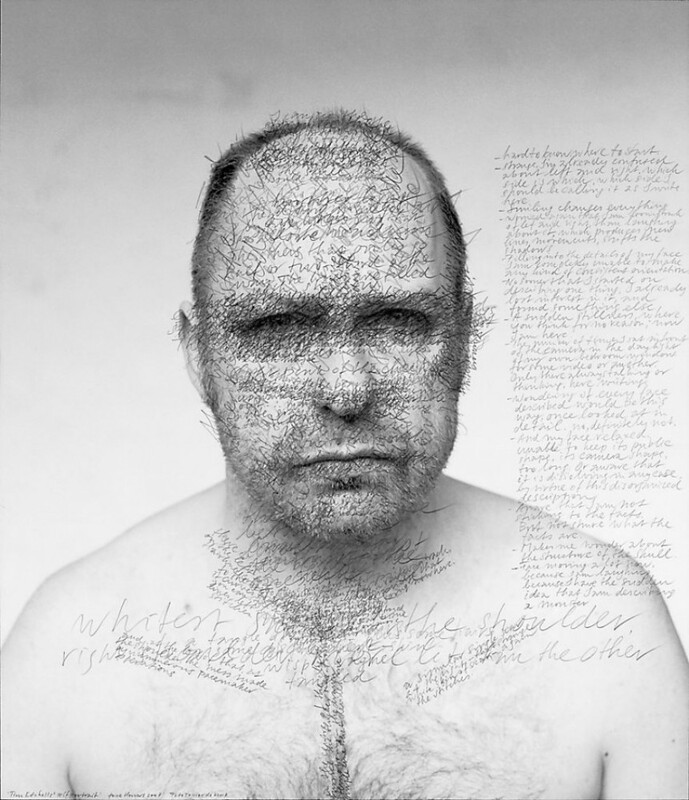 I chose Tim Etchells, artistic director of the British theatre group Forced Entertainment. Especially his personal performances have influenced the way I think about the relationship between theatre and visual art. I went to London, together with Rotterdam’s portrait photographer Tamar de Kemp. I asked Tim to give me a description of his own portrait, in the classic portrait tradition with a bared upper body. While looking in a mirror he typed his description of head and shoulders into a laptop. Tamar photographed his portrait in the same lighting conditions. Using a soft pencil I wrote Tim’s description on a large print of his portrait, all the texts in the right place and the right size and direction. I wrote a list of stray thoughts and observations in the space next to the portrait. brief description Tim Etchells’ textual description of his own portrait, written on a print of his portrait photograph.